That was the case in what led to a new collaboration between the Mendoza and Peck laboratories. 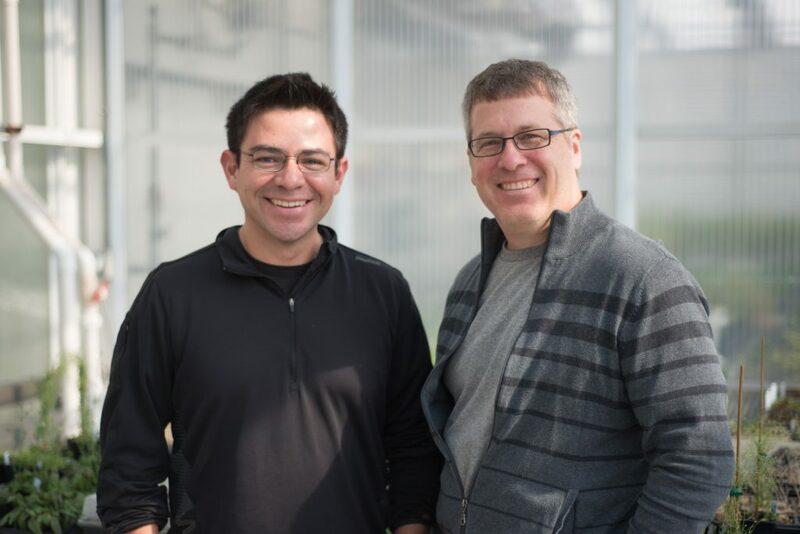 The two researchers were recently awarded $48,250 in seed money from the Bond Life Sciences Center to adapt a new technology to the study of signaling pathways in plant cells. David Mendoza, a Bond LSC researcher and assistant professor of plant sciences who is interested in nutrient uptake in plants, got the idea for the project when he attended the Trace Elements in Biology and Medicine conference in June. There, he kept hearing about an enzyme called BioID used to identify protein interactions in mammalian cells. “In plants, we have a hard time figuring out how proteins interact with each another to transfer information within the cell,” Mendoza said. BioID could be the key. BioID works like a spy slipping a small tracker into the coat pocket of every person it encounters, but instead of a tracker, BioID transfers a unique molecular tag onto every protein that comes near. It’s a speedy process, no matter how brief the interaction between BioID and the incoming protein. But once the proteins are tagged, they can be rounded up and identified later, even if they’ve moved elsewhere in the cell. Scientists can study which proteins interact with their protein of interest by linking BioID to their protein. This lets them track the signals being communicated to and through their protein without disrupting what’s happening inside the cell. Although BioID has exclusively been used in animal systems, Mendoza talked to the scientist behind BioID to see if it could be used in plants. Incidentally, BioID has been publicly available for several years but the enzyme was impracticable for plant experiments. It needed a lot of raw material on hand before it could start tagging proteins, much more material than what is normally found within plant cells. However, research on a more suitable candidate called BioID2 was published just months before the conference. Unlike its predecessor, BioID2 required very little starting material to function in plants. When he approached Scott Peck, a colleague at the Bond LSC and professor of biochemistry specializing in plant proteomics, with the news, Peck saw immediate applications for BioID2. With currently available methods, plant scientists have to look at protein interactions in artificial environments, such as in a test tube or in yeast systems. A real-time protein-tagging method would allow plant scientists to observe signaling pathways in their native environment–the cell–under a variety of conditions. “It allows the contextual information within the plant to still be present,” Peck said. For example, with BioID2 the Peck lab, which studies plant resistance to bacteria, could watch how incoming stimuli such as plant pathogens or stress from drought affect overall protein-to-protein interactions within plants, compare these protein interactions across different cell types, or even discover previously unknown protein interactions, he said. “You know you have a good idea when the other person gets excited right away,” Mendoza said. Peck also had a suitable model handy in which they could test BioID2 at work, but the two researchers first had to make sure plant cells could produce functional BioID2. Mission accomplished, the next step is to make plants produce BioID2 that is linked to their protein of interest. “The nice part of this seed grant is it lets us get a jump on some new technology to develop here,” Peck said. This seed funding is one of seven awarded this year at the Bond Life Sciences Center. These awards, which range from $40,000 to $100,000 in funding, foster inter-laboratory collaboration and make possible the development of pilot projects. It’s hard to avoid corn, rice or soybeans in your diet, and you’ve probably eaten or drank something today with at least one ingredient from them. Unfortunately for the billions of people worldwide who depend on these crops as a staple, they aren’t actually all that nutritious. Specifically, they lack sufficient quantities of amino acids. Amino acids might seem minor, but important parts and processes in our bodies from our muscles to enzymes are built from or work through them. That’s why Angelovici wants to enhance their availability in key foodcrops. In the case of amino acids, “What we’re trying to understand is the basic question of how those accumulate in seeds, and then from that basic concept we’re going to try to improve that in grain,” Angelovici said. No one really knows why so many of our most important crops that essentially sustain humanity lack sufficient essential amino acids. Maybe plants don’t synthesize amino acids because the cost in energy for the plant is too high, or because higher levels of amino acids might make them more vulnerable to attacks from hungry insects. Maybe if plants produced higher levels of amino acids, the taste would be too strong for human palates, and so our ancestors long ago selectively bred those traits out of crop populations. Or, maybe in ancient farmers’ pursuits of other traits in their crops, like higher quantities of starch, humanity accidentally boosted one nutritional trait at another’s expense. There are a lot of unknowns when it comes to these theories, Angelovici said. 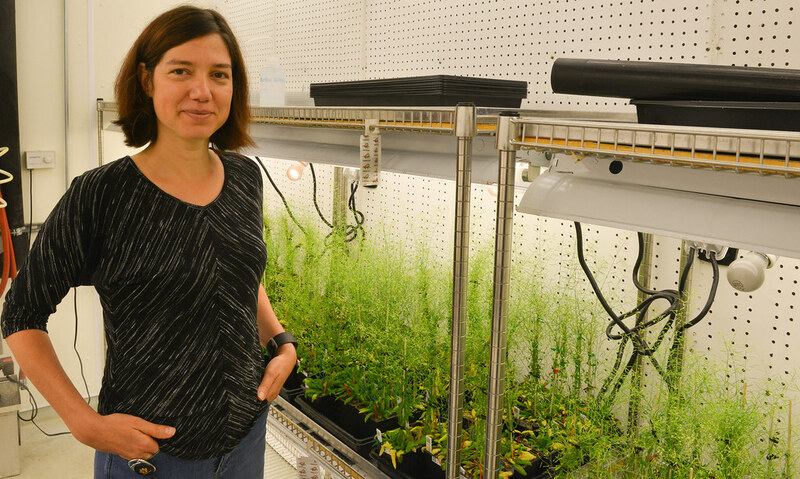 What is clear — and something Angelovici said she cannot stress enough — is how powerful a genetic tool she and her fellow researchers at Bond LSC have in the form of a collection of a vast amount of genetic variation of Arabidopsis thaliana. “Arabidopsis thaliana is a model [plant] system that a lot of plant scientists use, although it is not a crop, or anything like that, but it’s a great model plant to start with, and then everything we learn from it, we can try and figure out if it’s the same in maize, rice, soybean, and translate it,” Angelovici explained. 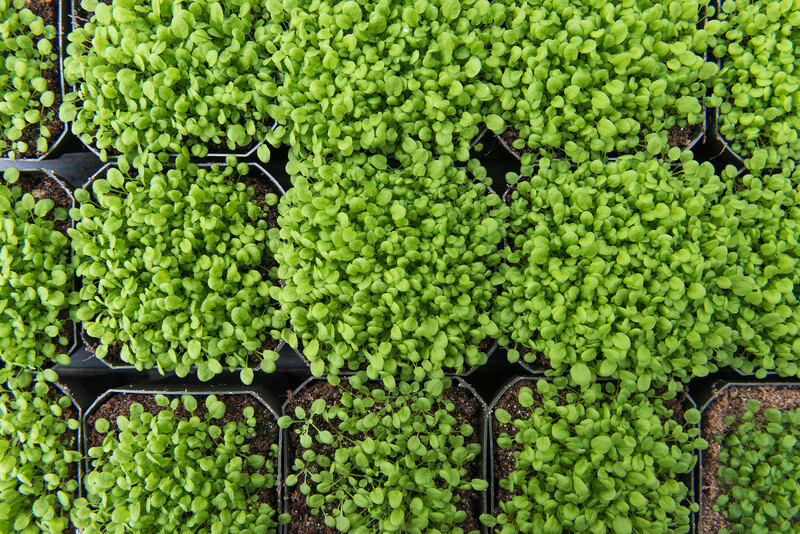 Part of the mustard family, Arabidopsis grows quickly so researchers can study four or five generations in one year. As an added bonus, this huge genetic variety but can be grown in just one room instead of large fields. For Angelovici, that room is in Bond LSC’s basement and the basement of greenhouses nearby. “We are growing right now 1,200 ecotypes of this Arabidopsis thaliana. So, what is an ecotype? It’s basically from the same species, but they have a slightly different genotypes. So, we’re looking at a vast genetic variation that represents genetic variation of this species across the world. Each ecotype comes from a different place,” she said. For those of you wondering, a genotype is the specific sequence of information in an organism’s genetic code — its genetic identity. A phenotype is an observable physical trait controlled by the genetic sequence. For phenotype, think in terms of color, size, shape — just like in different breeds of dogs and cats, for example. Even the smallest differences in genetics can produce the range of traits we observe, like the size difference between a Chihuahua and a St. Bernard — even though all the breeds are the same species. The same thing applies to plant species, too. Angelovici said researchers can use all the genetic variation in their extensive Arapidopsis collection understand questions of how observable traits relate to genes, and vice versa. Once that connection is established, “we basically have an address on the genome, and then we can go after the gene itself, understanding the function of the gene, and how that is affecting our variation of the phenotype, basically to help us understand the mechanism,” Angelovici explained. “And if you understand the mechanism, we might be able to improve it, change it, either through genetic engineering or breeding. Basically, mining what Mother Nature has already done throughout many generations, and trying to figure out if we can utilize that in crops,” she added. All this algorithmic analysis can eventually improve results. “When we get a candidate gene that we think affects one of the traits that we are interested in, we either knock it out or over-express it, and go back to the phenotype and figure out if it changes, and how,” Angelovici said. An understanding of seed development might be especially important in understanding how drought affects the nutritional quality of future generations of water-stressed plants. “Surprisingly, those are processes that are not well-understood — how the seed itself is adapting to water stress. A lot of people are working on water stress and drought at the plant level, in the yield [of a crop], but we’re trying to really understand what is happening on the level of the seeds, on the bio-chemical level, and then how that affects the next generation,” Angelovici explained. If she and her fellow researchers find a super-resilient seed, they could learn to transfer its resiliency to drought to future generations of seeds. Something they’ve seen already is that if you really water-stress a plant, while it may produce less seeds, seeds that it does produce are bigger. “Right now the question is, are they bigger because they are trying to adapt for their harsher environment, or are they just trying to survive?” she said. Is the parent developing its offspring in a certain way to ensure the best possibility of success of that offspring, or just so it can survive to reproduce another day? “We can only provide the data,” Angelovici said of her work in trying to answer questions like these, in order to improve the quality of human life by understanding and improving the quality of our food. Ruthie Angelovici is an assistant professor in the Division of Biological Sciences, and is a researcher at Bond Life Sciences Center. She received her degrees in plant science from institutions in Israel — her B.S. and M.S. from Tel Aviv University, and her Ph.D. from the Weizmann Institute of Science in Rehovot. She was a postdoctoral fellow at the Weizmann Institute and at Michigan State University, and has been at MU since fall of 2015. A new in-vitro fertilization technique that uses genetic material from three persons made the news last week following the announcement of the successful birth of a now five-month-old baby boy. The process allowed the mother, who had a rare mitochondrial disease known as Leigh Syndrome, to have a child without passing her faulty mitochondrial genes. The nucleus from the mother’s egg was inserted into a prepared donor egg that had healthy mitochondria to make a cybrid, or cytoplasmic hybrid, egg that was then fertilized. We asked Mark Hannink, Bond LSC scientist and professor of biochemistry, who studies oxidative stress in mitochondria, what this all means. This is not the first “three-person” baby. Why is this technique new? It’s another way of getting a healthy mitochondrial genome into the baby. You have to bring together three parts: nuclear DNA from the mom, nuclear DNA from the dad, and mitochondrial DNA from the donor. 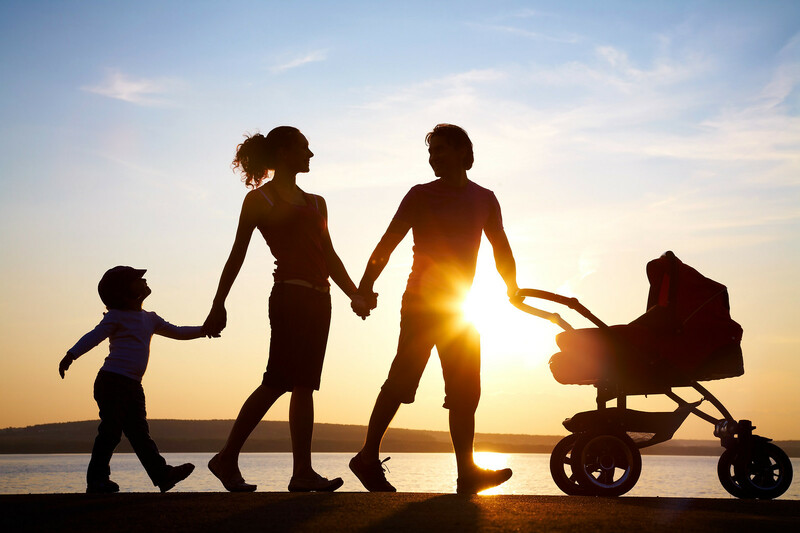 The question is whether you bring together the mitochondrial DNA from the donor and the nuclear DNA from the mom first, and then add the DNA from the father. The other way is making the diploid nucleus first (combining the mother and father’s DNA,) and then putting that into the donor. Wait, so we have two types of DNA in our cells? Way way early in evolution, a bacteria got together with a cell that had a nucleus, and they decided to cooperate. Over time, many of the genes that were originally in that bacteria’s genome moved to the nuclear genome. But some of them haven’t. The mitochondrial genome in humans has some 37 genes. But the mitochondria itself has about 1000 different proteins so those other proteins are encoded by the nuclear genome. Together, those proteins work together to form healthy mitochondria that, among other important jobs, provide energy for the cell. What makes this procedure controversial? Any time you manipulate the sperm and the egg, there is a chance that you will generate subtle alterations which result in defects in the child during development or after it’s born. Even in vitro fertilization, which has been shown to be effective and works, has a higher rate of diseases associated with it. Now you’re doing a whole set of complicated manipulations before you get to IVF….You take out the existing nucleus from the donor. You put in the nuclear genome from the mother. And you hope that it all comes back together and then you do the IVF…. Any time you do a manipulation like that, you may cause subtle mistakes that you’re not aware of. Then there’s the other concern. The mitochondrial proteins encoded by the nuclear genomes and the mitochondrial proteins encoded by the mitochondrial genomes have to work together to form functional mitochondria that make energy, regulate signaling, regulate calcium, regulate nerve transmission and cell survival. Your nuclear genes have been interacting with your mitochondrial genes throughout your entire natural lineage, so they’ve coevolved to work together. If, let’s say, there’s a minor mistake made in one of the nuclear genes that encodes a mitochondrial protein in your grandma, you might still get selected for a compensatory mutation in the mitochondrial genome that would still allow a functional mitochondria to be made….But the nuclear genome of one person may not be compatible with the mitochondrial genome of another person even though that mitochondrial genome is normal and works just fine in the context of that person’s nuclear genome. But there’s no way to know that in advance. So you may end up with a healthy baby, or you may end up with a baby in which the nuclear genome and the mitochondrial genome are not compatible.